A plane taxis down the runway Thursday afternoon at the Greeley Airport. 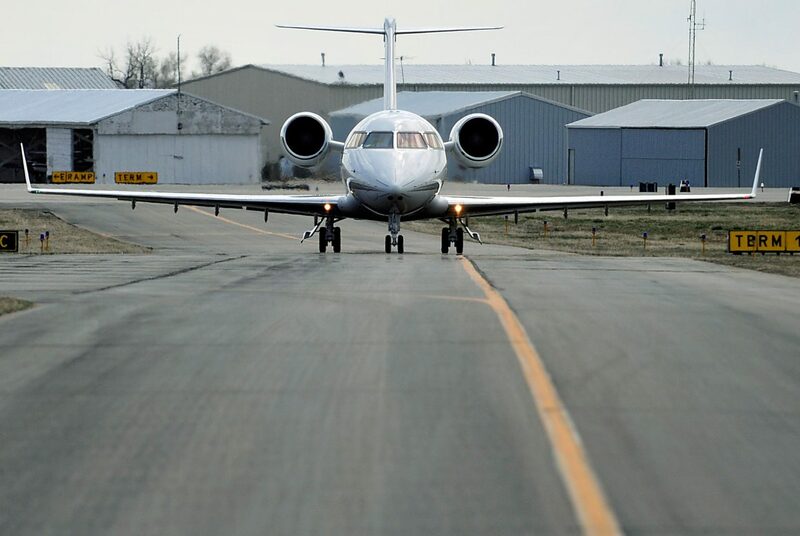 The airport has renewed its efforts to become part of the Greeley community. WASHINGTON – U.S. Sens. John Thune (R-S.D.) and Bill Nelson (D-Fla.), who respectively serve as the chairman and ranking member of the Senate Committee on Commerce, Science, and Transportation, today issued the following statements on the 93 to 6 Senate vote on H.R. 302, the legislative vehicle for the FAA Reauthorization Act of 2018, a five-year authorization of the federal aviation programs and a three-year reauthorization of the Transportation Security Administration (TSA). Headed to the White House for President Donald Trump’s signature, the legislation will help modernize airport infrastructure, improve service for the flying public, enhance transportation safety and security, and boost aviation industry innovation. The FAA Reauthorization Act of 2018 is the result of bipartisan negotiations among the leadership of the Senate Commerce Committee and House Committee on Transportation and Infrastructure Chairman Bill Shuster (R-Pa.) and Ranking Member Peter DeFazio (D-Ore.). Thune and Nelson thank Sen. Roy Blunt (R-Mo.) and Sen. Maria Cantwell (D-Wash.), who serve respectively as the Chairman and Ranking Member of the Commerce Committee’s Aviation Subcommittee; Sen. Deb Fischer (R-Neb.) and Sen.. Gary Peters (D-Mich.), who lead the subcommittee with responsibility for non-aviation Transportation Security Administration responsibilities for their contributions; and the entire membership of the full committee and the members of other Senate and House committees who contributed to the legislation. “There’s a lot to like in this bill, especially if you’re fed up with shrinking airline seats. It also goes to show that when folks in Congress put aside their differences, the public comes out the winner.”Sen. Bill Nelson, D-Fla. Provides funding for airport development. Increases flexibility to finance projects. Requires TSA to make available, in airports and online, real-time information on security line waits. Prohibits involuntary bumping of passengers who have already boarded. Directs FAA to set minimum standards for airline seat sizes. Requires private rooms for nursing mothers in large and medium airports. Ensures airlines promptly return fees for services (seat assignments, early boarding, etc.) not received. Strengthens aviation training, reporting, tracking, and cybersecurity. Provides new risk-mitigation authorities for unmanned aircraft systems (UAS). Authorizes more canine security teams and, to meet demand, expands ways to test and certify dogs. Streamlines certifications for design and delivery of aircraft to boost competitiveness of aviation manufacturing. Furthers efforts to safely integrate unmanned aircraft into the airspace through traffic management system advancements and research. Creates an Office of Spaceports to support licensing and promote infrastructure improvements. Authorizes approval for civil supersonic aircraft that reduce sonic booms. Provides $1.68 billion in supplemental appropriations for disaster relief in the wake of Hurricane Florence. Reforms Federal Emergency Management Agency (FEMA) programs to help communities better prepare for and respond to disasters of all types. Senate FAA bill section-by section summary (75 pages) available here. Joint Senate/House highlights summary (5 pages) available here. H.R. 302, FAA Reauthorization Act of 2018, full bill text (1207 pages) available here.